Waking up the morning after a relatively easy day gives a good feeling of having more energies, and when on top of this we see the bright light of the Sun peeking through the windows we get in the right spirit for the day. When we leave the hotel it's too early for the staff to be there, so we leave the key of our room in a basket left for that purpose and get downstairs into the parking lot. We fold our rain suits hoping to not have to use them any more, then get into the city roads. With the correct amount of light even the city that yesterday looked so dull has a different aspect, and when we spot a couple of walking henroes getting on the road we catch in their eyes and in their smiles our same feeling. 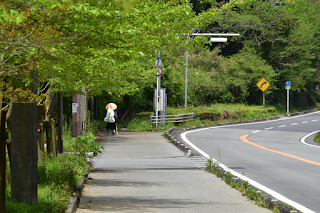 We quickly get on road 56 and follow it while it goes along the Sasagawa river. 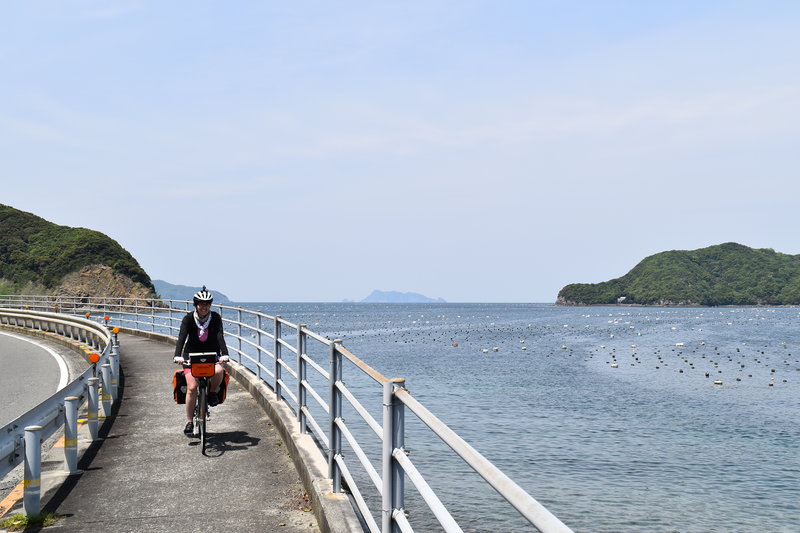 Then a short climb takes us to the Ipponmatsu tunnel: we have reached Ehime prefecture! 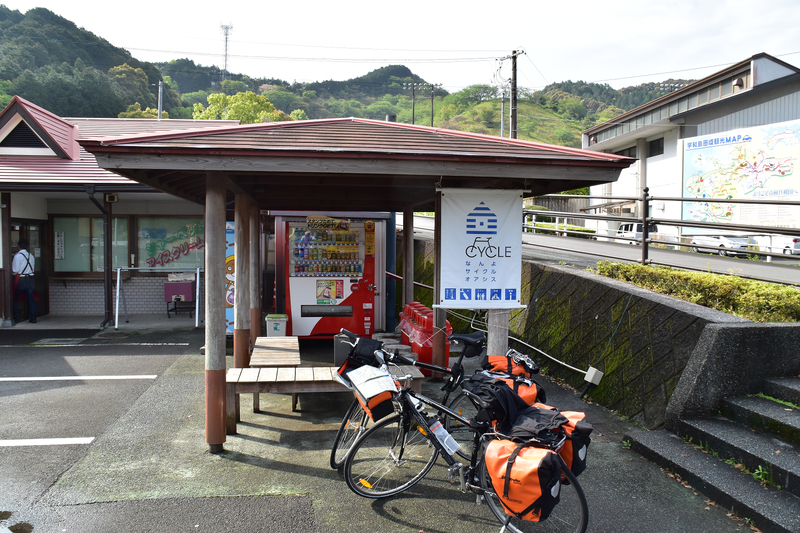 We quickly find that its fame as cycle friendly prefecture is well deserved: at our firs stop we find a rest hut well equipped for assisting cyclists, with pumps and all the necessary for small mechanical repairs made available. Continuing on the road we complete the first inland part of our day and finally reach temple 40. After it we get to cycle next to the sea: the sun shining on the pearl farming grounds scattered in the countless bays is really a gorgeous sight, and the small villages developing next to them give a calm feeling. 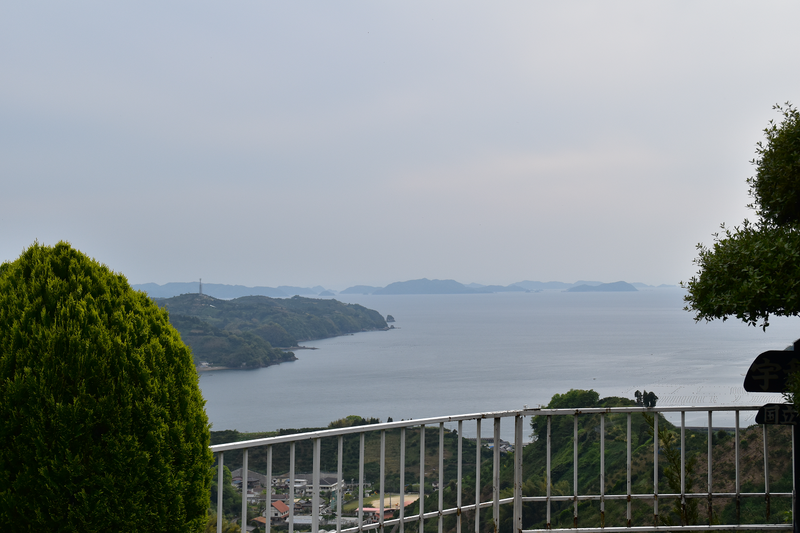 We could be in Mishima's The sound of waves, if we were on small island! Continuing on the road we have also feel privileged to have a tunnel built just for cyclists and walkers next to the main road. The air inside feels rather chilly when entering it directly from the sunny road, but it's not so long that we really get cold. 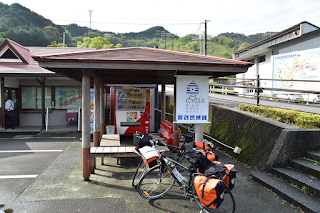 Further on the road, when it moves back inland, we find a really nice rest hut, where we stop for lunch. It is not too close to the road so it is not noisy, and it is pretty large and comfy. We take some pictures and send them to the camping henroes we have met along the way, as it might be a good place to spend the night. We stay on the 56, which becomes less used as soon as we meet the beginning of Expressway 56: we find way less cars using it, and what it remains are mainly trucks carrying woods or fruits. After a while the road starts to rise, and it becomes a never ending series of steep tunnels, where the noise of the trucks passing by becomes loud and scary. Adding the effort for the climb on a 12% slope to the claustrophobic feeling of the tunnels and to the strong noise of the truck we get a perfect mix of stressing factor, and we have to stop often to recover. Before the last but three tunnel my travel mate is about to break down in panic, and though we stop in a now closed service station with a magnificent view on the sea, surrounded by orchards growing on the steep sides of the mountains, we seem unable to proceed further. When I am trying to find a way to get out of this situation, our attention is captured by a peculiar show: few tenths of meter ahead of us a crow is lifting a dropping a red thing (we will later see it is a dead weasel). We quickly realize it is trying to carry it across the road, being too heavy to simply transport it by flying. 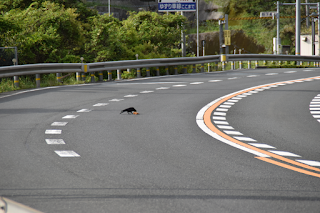 The risk the crow is taking is pretty high: cars and trucks are not going to slow down for it, and at any moment can simply drive over its dinner and mash it. 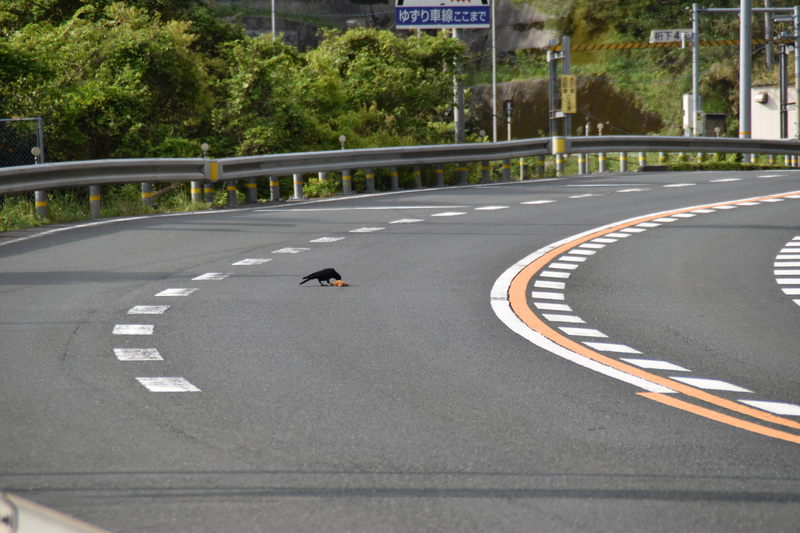 Nevertheless the crow keeps trying and trying, and when it finally reaches the other side of the road, dropping its load onto the side of the mountain, we cannot avoid celebrating for it. I then say out loud: "if the crow was able to carry that load across the road, why shouldn't we be able to reach the pass on this road and get to our hotel?". My intention was initially to joke about it, but it quickly turn out to be a pretty effective motivation speech, and we get back on the bikes and get rid of the remaining tunnels. The descent to the town is a pleasant reward, and when we reach our hotel we feel determined to have dinner outside. The man at the reception desk looks funny as Addam's family Lurch, but for the hotel room is nice and spacious, and we first get a shower. When we go downstairs we get in the streets looking for some place to eat. We see a group of three women talking between them, and we get close asking if they can recommend any place to eat. Considering that our Japanese is still at zero we can only tell names of dishes, like ramen, soba and katsudon, so they are already to be appreciated for trying to pay attention to these two funny gaijin. They start talking between them, and then one of the three just tells us "chotto matte kudasai" and disappears. We know it means something like "wait one moment, please", but we don't get what's going on. We then see a small car getting close, and in the driver seat we see the woman: she has gone to the parking lot to take her car, and is now bringing us to a restaurant. She apologizes for the small car (being 194 cm I fell a bit cramped in it, but I can only be grateful for what she is doing) and along the way we try to tell her something about us, while she tells us that she has already completed the Ohenro-san more than once. She drops us at a restaurant, the same chain were we had dinner with Truss and Suzanne, and wishes us a good dinner and a nice stay, while explaining us how to get back to the hotel. 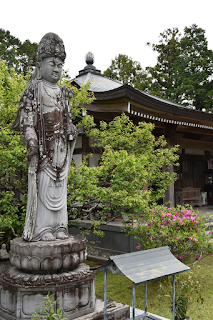 We regret not having with us some osettai to give her, so we only bow and thank her for the exquisite gesture. We then have our dinner, and then we enjoy the short walk back to the hotel. 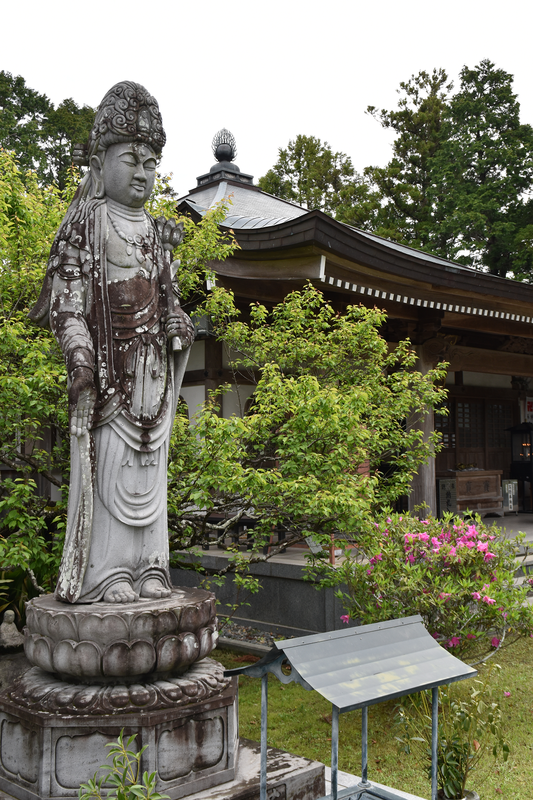 We start thinking that not knowing any Japanese is really a pity, as we miss the chances of a better interaction with the locals. But this doesn't stop them from lending an helping hand.